Prevent scratches on your fifth-wheel's skid plate and ease trailer hookup by installing this nylon lube plate. Works with Reese 20,000-lb fifth-wheel trailer hitches and Reese Elite Series (or Signature Series) fifth-wheel trailer hitches. 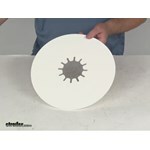 Call 800-298-8924 to order Reese accessories and parts part number RP83001 or order online at etrailer.com. Free expert support on all Reese products. Guaranteed Lowest Price and Fastest Shipping for Lube Plate for Elite Series and Reese 5th Wheel Trailer Hitches - 12" Diameter. Accessories and Parts reviews from real customers. Today we're going to review part number RP83001. This is the Reese lube plate for Elite Series and Reese fifth wheel trailer hitches. It's 12 inches in diameter. Now this lube plate will prevent scratches on your skid plate of your fifth wheel trailer hitch. This will let your trailer kingpin slide into the trailer hitch with ease, and there's no need for any messy grease. This does offer extra protection with the large surface area, and it is constructed of a durable nylon. Just to give you an idea, here's what the kingpin would be, and it's on your fifth wheel trailer. That's what would connect to your fifth wheel hitch. Before you make your connection, you just slide your lube plate on, and then this would slide . The kingpin would slide into your fifth wheel trailer hitch. This plate will give you the lubrication and the protection, helps as far as turning and prevents your skid plate of your hitch from getting scratches on it. The application for this lube plate is it fits Reese fifth wheel trailer hitch with a 20,000 pound weight capacity. It also fits the Reese Elite Series and Signature Series fifth wheel hitches. A few dimensions on this, again, the diameter overall is 12 inches. The thickness is right at 3/16 of an inch. That should do it for the review on part number RP83001, the Reese lube plate for Elite Series and Reese fifth wheel trailer hitches. .
Order: RelevanceNewestRating - High to LowRating - Low to High Prevent scratches on your fifth-wheel's skid plate and ease trailer hookup by installing this nylon lube plate. Works with Reese 20,000-lb fifth-wheel trailer hitches and Reese Elite Series (or Signature Series) fifth-wheel trailer hitches. Lube plate works great. Eliminated the greasy mess that I had before. Still working after a year, I purchased an extra one as I did not know how long they would last. The extra one is still in its packaging stowed away until needed. The only difference between the two lube plates is the color and their thickness. The # RP83004 is black in color, and is 1/8 of an inch, or .125 thick. The # RP83001 is white in color, and is a bit thicker at .192 of an inch, or just below 1/4 inch thick. I would recommend going with the thinner # RP83004, as using a plate that is too thick might make hitching more difficult. I spoke to my B and W contact who tells me that it is perfectly acceptable to use a lube plate if you wish. For a B&W Companion hitch I recommend using a 10 inch diameter lube plate. We have the Reese Lube Plate, # RP83002, which is my top choice, and the Curt 10 inch Fifth Wheel Trailer Hitch Lube Plate, # 16721, both of which will work nicely with your Companion hitch. The proper size Lube plate for use with the B and W Companion hitch is a 10 inch diameter lube plate. We carry two lube plates this size. The Reese Lube Plate for Reese 5th Wheel Trailer Hitches - 10 inch Diameter, item # RP83002, and the Curt 10 inch Fifth Wheel Trailer Hitch Lube Plate, item # 16721, will both work with your Companion hitch nicely. For your fifth-wheel hitch you will need the 10 inch Fifth-Wheel Lube Plate, item # 83002. The 12 inch Lube Plate, item # RP83001, is for the larger hitches and the Reese Signature Series hitch. Actually you aren't supposed to use a lube plate with a Sidewinder/Reese Revolution Pin Box. Reese states that you should just grease the top of the hitch and you would be good to go. The # 83003 is only designed to fit the Titan 16 hitches so it would not fit your Reese Elite 18k hitch. I spoke with my contact at B & W, and they told me that you should have no problem at all using the Curt 10 inch Fifth Wheel Hitch Lube Plate, part # 16721. This plate does measure 1/4 inches thick, and helps reduce normal wear and tear. The correct lube plate for a Reese Elite Fifth Wheel Hitch part # RP30142 is the 12 inch diameter lube plate part # RP83001. The Reese M5 5th Wheel Trailer Hitch for Chevy/GMC Towing Prep Package # RP30890, you can use a little grease like # L10307 or for less mess I recommend the Lube Plate for Reese 5th Wheel Trailer Hitches # RP83001. 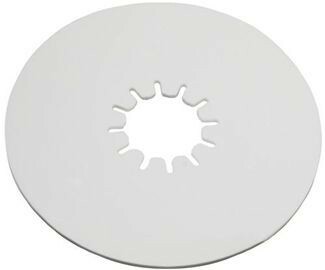 The nylon lube plate for the Reese Elite Series Pre-Assembled 5th Wheel Trailer Hitch, part # RP30142 you referenced I recommend is part # RP83001. This lube plate measures 12 inches diameter and will work with Reese fifth wheel hitches with 20,000 lb capacities and also Reese Elite and Signature series hitches. The correct lube plate for the Reese Elite Series 26.5K hitch, # RP30871, is lube plate # RP83001. You can move a lube plate from trailer to trailer. However, once a lube plate is in place it can be difficult to remove it. It can become hard and could break when trying to pull it off the trailer king pin. There's no such thing as a stupid question when it comes to fifth wheel towing! It's always better to be safe than sorry when towing such heavy trailers. For a Pro Series 16k fifth wheel hitch you would want the 10 inch diameter lube plate part # RP83002. The one you referenced is 12 inches in diameter and would be too big. I recommend the UltraLube Biobased White Lithium Grease, part # L10307. I prefer the Nylon lube plates from Draw-Tite for the head surface, part # RP83001. If you use the lube plate, you can avoid using grease.